The first area in Iowa Territory to receive white settlers was Lee County, located in the southeastern tip of the territory along the Mississippi River. The first Mennonites to settle in Iowa were John C. Krehbiel, wife, and son, of Butler County, Ohio, who arrived in Fort Madison, Lee County, on 1 November 1839. The first Mennonite child to be born in Iowa was the Krehbiel daughter Johanna Maria (26 January 1840), who became the wife of Daniel Hertzler and the mother of the famous "Horse and Buggy Doctor" Arthur E. Hertzler. In 1849 Krehbiel was chosen minister of the West Point Mennonite Church (Bush Church), where he preached until his death in 1886. Mennonite settlers followed Hertzler, locating near his home a few miles south of West Point. In 1849 these settlers organized the West Point Mennonite Church and elected two ministers, Krehbiel and Jacob Ellenberger. They then built the first Mennonite church in Iowa, 1.5 miles (2.5 km) east of the town of Franklin, and held their first service in it on Pentecost 1850. Eventually the Bush church was abandoned and a new building was constructed in West Point. In time this church was abandoned as most of the members moved to other communities. In the early fifties Palatinate Mennonites moved to Franklin Township, Lee County, about eight miles from West Point, and there organized a church. Their first church, built two miles northwest of Donnellson in 1855, came to be known as Zion, and was rebuilt in 1880. In 1909 their third church was erected in the town of Donnellson. The Mennonites decided that their two churches were too far apart and so they constructed a third one in the town of Franklin in 1868. This church began to decline a few years later when members moved away, and became extinct. The West Point and Zion churches are important for the part they played in the organization of the General Conference Mennonite Church. In 1853 the two congregations had held a conference in which they agreed to work together in harmony, and in a second conference in 1859 they agreed to invite other Mennonite churches to join their union. As a result, the delegates of four churches met at West Point on 28 and 29 May 1860 in a meeting that is regarded to be the beginning of the General Conference Mennonite Church. In 1954 the Lee County General Conference membership was 233. Probably the first Amish Mennonites to move to Iowa were the members of the Christian Raber family, who came to Lee County from Hamilton County, Ohio, in 1840, and settled near Charleston. Christian is the ancestor of several Rabers who became ministers in the Mennonite church. The Rabers were joined by other families: Rogie, Kinsinger, Werey, Hauder, Reese, Fordemwalt, Augspurger, Goldsmith, Schwartzentruber, Plank, von Gunden, Wagler, Shantz, Lehman, Schrock, Musser, King, Klopfenstein, Miller, Schlotter, Bechler, and Roth. Davis and Henry counties and other places. This was caused in part by the faulty land titles held by some of the Amish settlers. Gingerich, Melvin. The Mennonites in Iowa : marking the one hundredth anniversary of the coming of the Mennonites to Iowa. Iowa City, IA: State Historical Society of Iowa, 1939. Krehbiel, William J. History of One Branch of the Krehbiel Family. McPherson, 1950. Neufeld, Vernon. "Mennonites Settle in Lee County, Iowa." Mennonite Life 8 (October 1953): 170. Gingerich, Melvin. "Lee County (Iowa, USA)." Global Anabaptist Mennonite Encyclopedia Online. 1957. Web. 19 Apr 2019. http://gameo.org/index.php?title=Lee_County_(Iowa,_USA)&oldid=92410. Gingerich, Melvin. (1957). Lee County (Iowa, USA). Global Anabaptist Mennonite Encyclopedia Online. 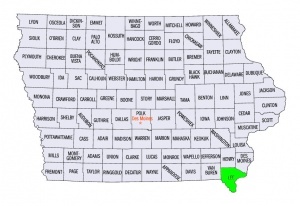 Retrieved 19 April 2019, from http://gameo.org/index.php?title=Lee_County_(Iowa,_USA)&oldid=92410. Adapted by permission of Herald Press, Harrisonburg, Virginia, from Mennonite Encyclopedia, Vol. 3, pp. 304-305. All rights reserved.